Disclosure: This post is sponsored by Dwellbee. All opinions, images and love of decorating small spaces are 100% mine. I posted earlier this week about the design plans for our small mudroom. Which you may recall was actually just a big blank wall in the kitchen. I’ve had readers ask for more ‘how I go from blank walls to finished design’ blog posts, and this little mudroom is a good place to dive into that process. Decorating should be fun not overwhelming! Think about your priorities for the space and the look you want. First, a look back at how the space started, because I think you can’t really appreciate a good ‘after’ till you see a space’s beginnings. Storage, seating, lighting, whatever your priority is for a space, start there. Functional, pretty storage was most important here so it was my starting point for this space. We wanted (needed) places to stash shoes, keys, coats, sunglasses, Oakley’s leash, you name it. Cue the hooks, key rack and crates. We had the hooks already – more on that in a second – which led to shopping for the other storage pieces. The rustic look of the wood message center with the mail sorter and key hooks matches the wood on the hooks just perfectly. The message center is from Dwellbee. You may recall I got a wood tray from Dwellbee earlier this year, which is equally rustic and pretty. Green With Decor readers can get 15% off any item from Dwellbee with the code GREEN15. Plus there’s free standard shipping. The mail sorter caddy is PERFECT for hiding Oakley’s leash. I can’t even tell you how happy this makes me. Oakley’s cute and all (and, like I shared on my Instagram Stories earlier this week, she literally wouldn’t stop following me around while I was taking these pictures), but we don’t need to stare at her leash all the time. Stashing it in this little cubby keeps it hidden and makes it easy to grab as we’re walking out the door. I also was determined to find a cute way to store our shoes. The wood crates, in that same beautiful rustic wood color, with the rope handles were the winner. I popped some furniture pads on the bottom of them to keep them from scratching the bench in case we want to leave the cubbies open at some point in the future. After storage was taken care of, I shopped our house for some pieces we could use. Which is always fun, right? Shopping is great, of course, but using what you have in a new way is a fun challenge, too. I bought the hooks before we moved – they will actually be perfect for the landing in our Milwaukee house. We’re reusing the window valances from our kitchen in the Milwaukee house. It’s a fun DIY (and one of my most popular blog posts). The fabric started as a shower curtain. You can read about the shower curtain turned window valance here. That picture frame with our wedding date fits perfectly in that little wall space on the other side of the window. We used those numbers as our wedding table numbers (an easy DIY!). We’ve had the throw pillows for a while. I pretty much buy throw pillows in the same general colors for the entire house because then I can swap them out between rooms when I get bored without having to buy new. Win-win. Think about what colors you want in the space. I’m apparently having a thing with dark wood lately between the message center/key rack, hooks and crates. I love it. The wall color is Aesthetic White by Sherwin Williams. Obviously my love of green is alive and well. The window valance and pillows add pops of color. Focus on the ‘feel’ you want the room to have and incorporate textures that will make it happen. To keep with the beachy/coastal design theme we’re going for in this house, I wanted a mix of wood, crystal and rope textures in this makeshift mudroom. I bought yet another of my favorite curtain rods with crystal finials. (It’s embarrassing how many of these we own between this house and our Milwaukee house. Actually never mind, I love them.) The crystal balances out all of the dark wood pieces. I specifically looked for storage crates with rope handles. I cannot get enough rope lately! I might need an intervention. Remember to head over to Dwellbee and use code GREEN15 for 15% off any item. Happy shopping! Do you have a small mudroom? How did you design it? Any tips for keeping it organized? Your back foyer looks fantastic! You did a great job of incorporating the function & style you wanted for the space. Btw, I am loving those dark wood bins with the rope handles! Thanks, Emily! I love how it came together, and I’m loving those dark wood bins, too! Meg, this looks SO great! 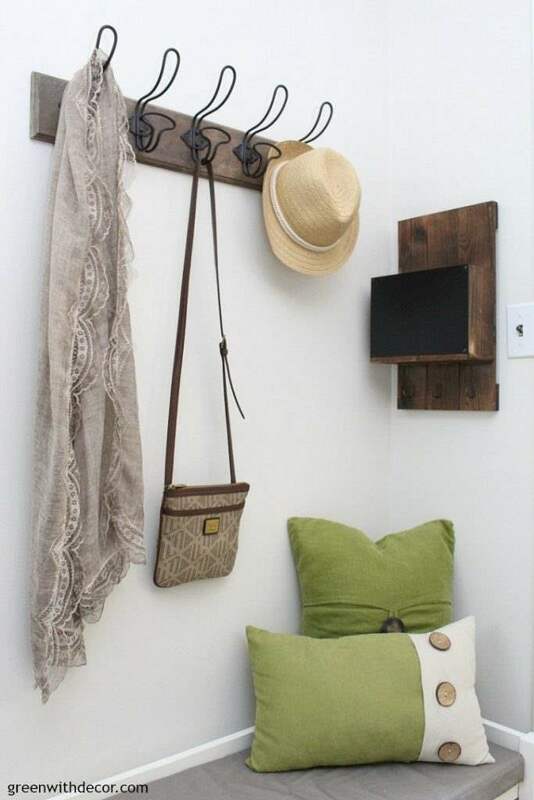 I love the bench with the storage and the coat hook (I have that one too!) but your cute dog steals the show! Thanks so much!! Aren’t the hooks great? And thanks, Oakley is a cutie! I love all the function and organization in such a small space. It’s pretty too!! Thank you, love it when pretty pieces help keep you organized! It looks so good! You did an amazing job there, combining funciton and decor is not always the easiest task, but you nailed it! The house is looking so good and I love this little area! You are really making it uniquely “Meg”. I love all the choices you picked here! Thanks, April! I’m really happy with how this little corner came together!